The dog days of summer have certainly arrived! Hot weather like we have been experiencing so far this summer leaves us naturally longing for mellow, easy activities: beaches, poolsides, backyard barbecues, and cool drinks. Here on the farm though it is just as busy as ever, with the triumphs and pitfalls that exist each season. The biggest challenge so far has been the consistent lack of rain. Just recently we have had a few good rainfalls, but we have had to resort to irrigating. This is done carefully and with great consideration, because with the lack of rain the levels of our beloved Nith River drop too. Not every field is close enough to the river for irrigation to be possible. 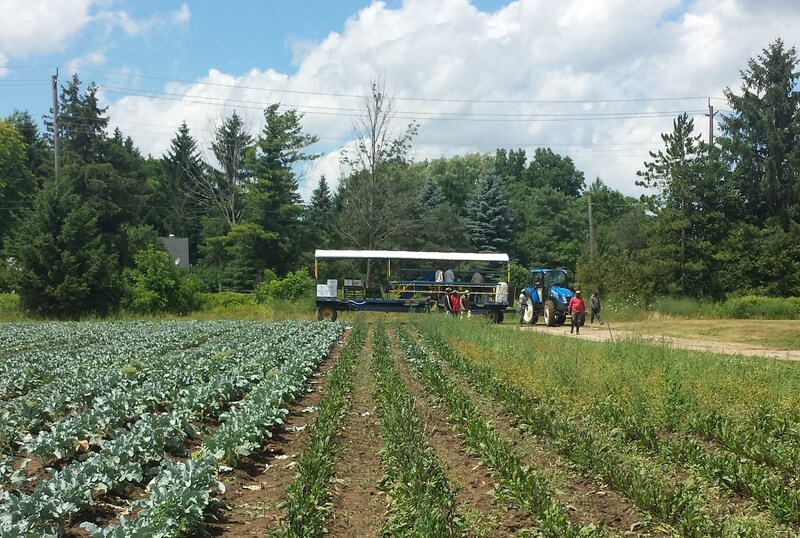 Also, certain crops cannot be irrigated under the Canada GAP standards. This means that a few of our key items are growing quite slowly, and our crop timing is off. 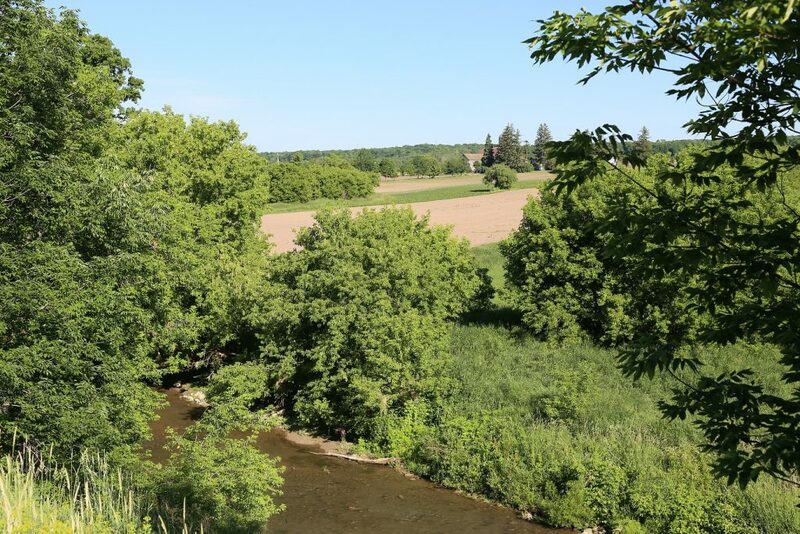 Water levels are low in the Nith River. Overall however it’s a great season! Every year we work on ways to improve on what we’re doing, and work on some new things. We are using a new harvest aid this year, and it’s increased our efficiency greatly. It’s kind of like a conveyor belt on a wagon. It speeds up the packing process quite a bit, and physically is easier on the crew. Harvest aid – increases efficiency during harvest time. For the first time we are growing cauliflower here on our own farm. Wolfgang has been learning from other growers about the best techniques, and so far it seems to be going quite well. We will continue to pack cauliflower under the Pfenning brand for our grower partners – this is available now. Our own isn’t ready just yet. Stay tuned! We are growing ~100 acres of carrots this year, which is more than we’ve ever done before! 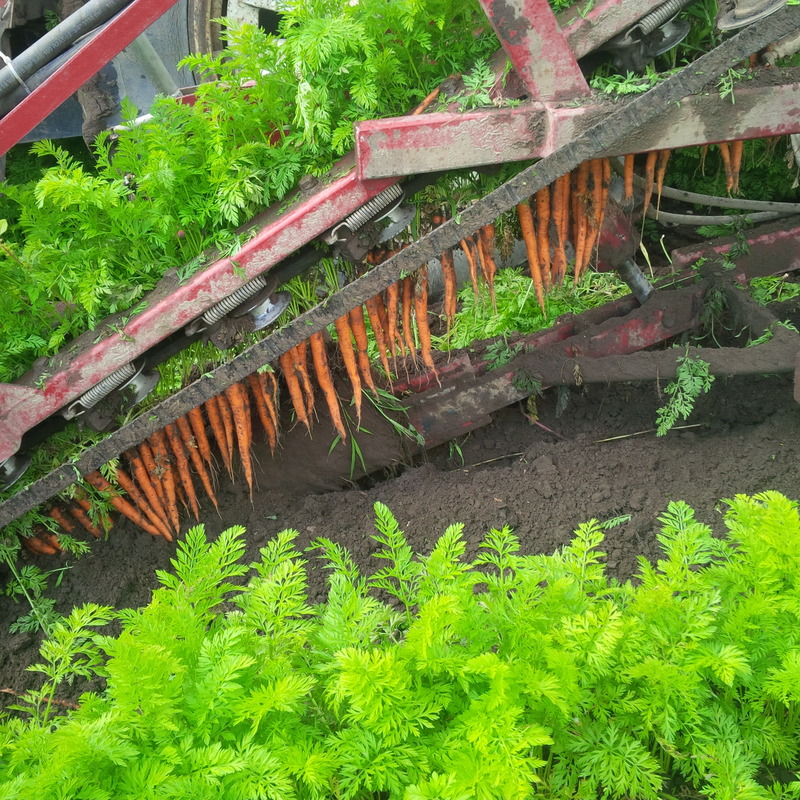 We have recently been able to harvest a few bunched carrots (sold very quickly), and should be able to start packing 2lb and 5lb quite soon! Lettuces, chards, spinach have been excellent. Root crops are starting to become available now, including beets and turnips. 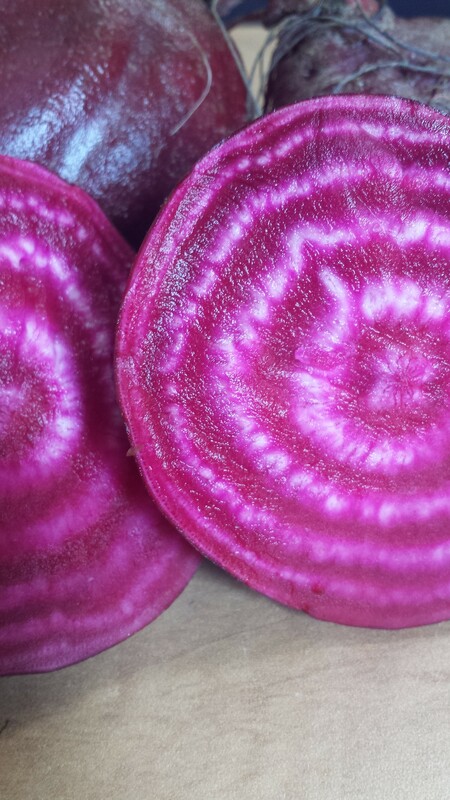 Ever tried a Chioggia beet? They are stripy inside, like a candy cane lollipop! Stripy Chioggia beet. Isn’t it pretty? In order to accomplish all of this, we rely on a great team of employees. Compared to this time last year, we have ten more workers out in the fields. Doesn’t sound like much, but it really does allow us to do so much more. Now we just need some rain!